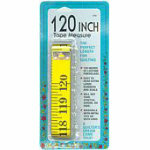 120" of lifetime fiberglass, with easytoread extra large numbers. Washable with metal tips on both ends. 6 per box.